Complex multivariate testing problems are frequently encountered in many scientific disciplines, such as engineering, medicine and the social sciences. As a result, modern statistics needs permutation testing for complex data with low sample size and many variables, especially in observational studies. The Authors give a general overview on permutation tests with a focus on recent theoretical advances within univariate and multivariate complex permutation testing problems, this book brings the reader completely up to date with today’s current thinking. Examines the most up-to-date methodologies of univariate and multivariate permutation testing. Includes extensive software codes in MATLAB, R and SAS, featuring worked examples, and uses real case studies from both experimental and observational studies. Includes a standalone free software NPC Test Release 10 with a graphical interface which allows practitioners from every scientific field to easily implement almost all complex testing procedures included in the book. Presents and discusses solutions to the most important and frequently encountered real problems in multivariate analyses. A supplementary website containing all of the data sets examined in the book along with ready to use software codes. Together with a wide set of application cases, the Authors present a thorough theory of permutation testing both with formal description and proofs, and analysing real case studies. Practitioners and researchers, working in different scientific fields such as engineering, biostatistics, psychology or medicine will benefit from this book. Professor Pesarin has been actively involved in the areas of multidimensional testing and permutation for almost 40 years, and is the author of dozens of publications in numerous international journals. Within the last 10 years, Dr Salmaso has amassed a large number of published articles, in a variety of journals, and has taught a number of courses in statsistics and nonparametric methods. 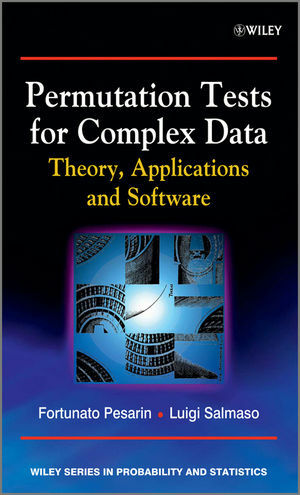 Permutation Tests for Complex Data (companion website) Visit the companion website to learn more about the concepts discussed in this book.